My grandmother passed away peacefully in her sleep yesterday. She would have been 85 next month. As I sit here by myself in my lush but very lonely Toronto hotel, I am overwhelmed with sorrow at losing my last living grandparent. I am devastated to be so far from home. Here for visa renewal, my passport is being held "hostage" by the US consulate so I can't fly back to see granny a final time. I last hugged her a year ago, and though deep down I always knew I wouldn't be around when she departed, I was under some misguided assumption that final goodbyes were still awhile away. I mean she was pretty darn healthy right up to the end. Granny was awesome. My brother and I had a playful relationship with her (It is he who cheekily got her to pose for this picture). She always had something nice to say about what I wore even if the miniskirts I wore went against her conservative views. She was an excellent cook, making sure everyone was well-fed - my mum and my aunts swear they learnt all they knew from her. As her short-term memory began to fail in her later years, I used to tease her mischievously about losing things, like the time she misplaced her dentures! She insisted on education and would always ask if I was getting on alright in school, long after I graduated. I stopped correcting her ages ago. Whilst I weep at every thought of her, the outpouring of loving messages from friends and family has been deeply comforting. I find great solace in phone calls with my mother too, who is so remarkably strong at the loss of hers. Granny was very pious and I am comforted that she is now in her paradise, to be with her husband, two sons and everyone else who left before her. As she wished, granny will be cremated and her ashes scattered over my grandfather's grave. Together in life, they will now be together in the afterlife. I miss you so much Granny. You are and will forever be loved. I'm o sorry to hear this. Big hug! 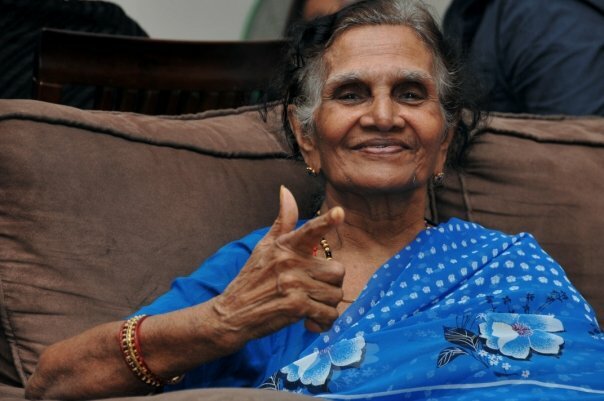 Usha, so sorry to hear of your loss. You are in my thoughts. Oh Usha, I'm so sorry to hear the news about your Granny. Hang in there.